SHANGHAI (Reuters) - China's yuan slipped past the 6.7 per dollar mark on Tuesday for the first time in almost a year, prompting what traders described as efforts by state-owned banks to prop up the currency as anxieties over U.S. trade frictions deepened. Stocks also dived anew, dragged down by consumer and healthcare shares, as Beijing and Washington hurtled toward an end-of-week tariff deadline that has kept investors in China nervous. In the face of the sell-off on Tuesday, China's state-controlled media kicked into gear, calling the fall in stocks an "irrational overreaction" and urging investors not to panic over the growing trade frictions. The yuan fell to 6.7204 per dollar, its weakest since Aug. 7, 2017 and the first time it dropped below 6.7 since Aug. 9, 2017, before recovering to 6.6997 per dollar at 0325 GMT. The currency has lost more than 4 percent of its value against the dollar since mid-June. 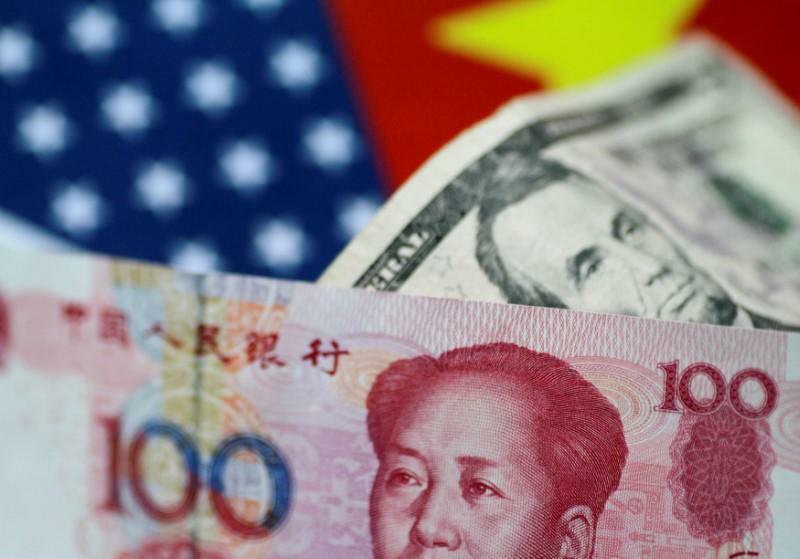 The central bank was not immediately available to respond to Reuters' request for comment on the yuan's moves. "It feels like the state-owned banks are stocking up on bullets to prevent the yuan from falling too much," said one trader at a Chinese bank in Shanghai. The central bank earlier set the stage for the drop by putting the midpoint at 6.6497 yuan per dollar, its weakest fixing in about 10 months. "It's a crucial day for the yuan today," said Ken Cheung, senior Asian FX strategist at Mizuho Bank in Hong Kong. Speaking at a ceremony marking the one-year anniversary of a scheme that connects Hong Kong and mainland bond markets, Pan Gongsheng, deputy governor of the People's Bank of China and head of the foreign exchange regulator, said China was confident of keeping the yuan basically stable and at a "reasonable" level. In equities, the blue chip CSI300 Index ended the morning trading session down 1.86 percent after dipping by more than 2 percent, while the Shanghai Composite Index fell 1.27 percent. The outlook for Sino-U.S. trade relations was further clouded on Tuesday by Washington's moves to block China Mobile from offering services in the U.S. and news that growth in China's exports to the United States has slowed significantly this year. Hong Kong's Hang Seng Index was hammered after a one-day hiatus on Monday to mark the day that the former British colony was returned to China. It was down by around 3 percent. "Intensifying trade frictions between China and the United States are a test that the Chinese economy inevitably had to experience during its rise," the Economic Daily said. "We have long anticipated and prepared for this...The impact on the Chinese economy is within a controllable range." The Securities Daily newspaper, meanwhile, called the slump in the mainland stocks an overreaction, saying that investors should have confidence in China's domestic market and that the current macroeconomic situation was stable.